They Must be Reliable — Extensive design and ongoing testing ensures that every product will operate as promised. Parts Have to be Durable - Even under the most extreme use, we offer braking components that can stand up to your driving habits. They Have to Be “Good” - Of course operation and performance are priority, but we believe that braking components also need to be low noise, low dust, and long lasting as well. Over the many years Phoenix Friction has been offering brake parts in the automotive industry, we’ve worked with some of the toughest projects and applications you could image. This includes industrial applications, fleet vehicles, and even police vehicles — we use those same engineering basics and designs in our all of our braking components. 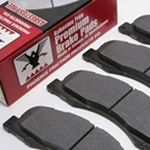 Shop now for superior quality brake pads, rotors, drums, shoes, and hardware from stock replacement parts, to ultra performance upgrades. Once you install brake parts from Phoenix Friction, you’ll never want to shop anywhere else again!